Layering of patterned papers is a great way to add colour and texture to your background without making your page too bulky. In this layout, several papers with a similar colour scheme were layered to provide a foundation for the page. It was then 'dressed up' with a selection of stickers and ribbon. This layout was created using Creative Imaginations Tan Suede paper, Creative Imaginations Wrinkled Rust paper, Hot Off The Press Brown Marble paper, Creative Imaginations Oak Squares paper, Doodlebug Brown Dots paper, brown cardstock, light brown cardstock, brown ink, brown and white ribbon, brown and white organza ribbon and Suzy's Zoo Dogs stickers. Begin by layering your background. Use the Creative Imaginations Tan Suede paper as the base. Cut a strip of Creative Imaginations Wrinkled Rust paper approximately 6.5cm tall and adhere along the bottom of your page. Cut a piece of Hot Off The Press Brown Marble paper approximately 23cm by 21cm. Adhere directly above the Wrinkled Rust paper approximately 2.5cm from the right edge of your page. Finally, cut a piece of Creative Imaginations Oak Squares paper approximately 19cm by 13.5cm. Again, adhere directly above the Wrinkled Rust paper and approximately 1cm from the right edge of your page. Adhere a brown and white ribbon across your page on top of the join between the Wrinkled Rust paper and the other patterned papers. Mat your photo with brown cardstock. Mat again with Doodlebug Brown Dots paper and again with brown cardstock. Tie brown and white organza ribbon around the bottom of the photo. Adhere to your background approximately 4cm from the top and 2cm from the left edge. Cut a paw print shape from light brown cardstock. Ink the edges with brown ink and adhere in the bottom right corner of the page on top of your ribbon. Place a dog sticker inside the paw print. Position the rest of your Suzy's Zoo Dogs stickers as shown above. Cut the first word of your title from brown cardstock and position along the join between your Oak Squares and Brown Marble paper. 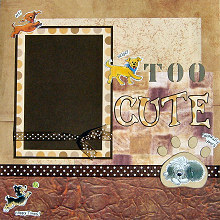 Cut the second word of your title from Doodlebug Brown Spots paper and mat with brown cardstock. Adhere below the first word of your title. Finally, if you wish, add journaling to the bottom right corner of your page.